2018 Hyundai Kona Iron Man Edition revealed | Car News, Reviews, & Pricing for New & Used Cars. 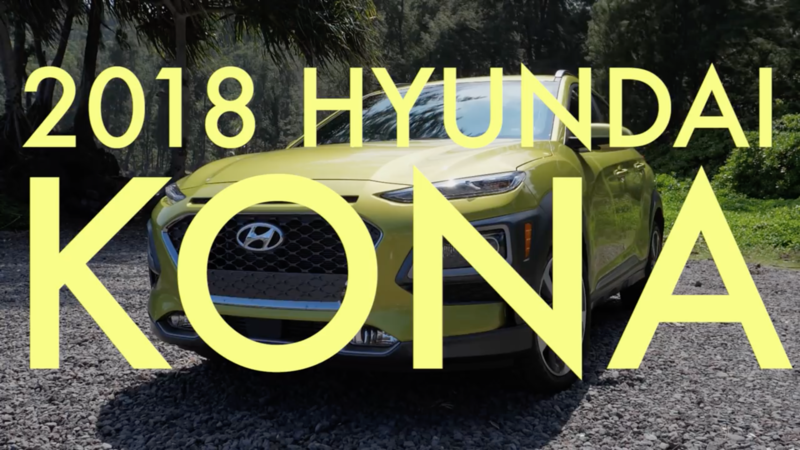 Following Hyundai’s collaboration on developing a frankly garish Veloster for Ant-Man and The Wasp, the company is teaming up with Marvel once again to launch a special edition of the 2018 Hyundai Kona compact crossover SUV. This one is themed after superhero Iron Man, and unlike the Veloster, this car is actually available to purchase. It’s a little odd to see a car that’s not an Audi used to go with Iron Man, but Hyundai has done a lot to get the Kona Iron Man-ready. The upper daytime running lights have been adjusted in design and color to more closely match the glowing eyes of Iron Man’s mask. The hood has also been redesigned with an insert that looks like a heat extractor vent, but is just a red plastic piece. The whole car is painted matte black with a metallic red roof and matching accents all over the exterior. The roof gets a giant Iron Man mask decal, too. On the sides there are badges of his mask on the fenders and on the wheel center caps. The rear doors get Stark Industries logo decals. The inside hasn’t been left out either. It appears to be the interior found on the lime green Limited and above trim levels, but instead of lime accents, there are even more red ones. Tony Stark’s (Iron Man’s not-so-secret identity) signature is found on the dashboard. The gauges have custom graphics themed around Iron Man, including a custom design for the heads-up display. On a side note, the Hyundai Kona Iron Man Edition is not the first superhero-themed car available to the public, nor is it the first Iron Man car. Jeep previously had a special edition Renegade for the Batman vs. Superman movie. And while it wasn’t the Iron Man superhero, Isuzu had a special edition Vehicross for the Iron Man Triathlon event. The Hyundai Kona Iron Man Edition goes on sale in the first quarter of 2019, and it will be a limited-production vehicle. Pricing hasn’t been announced yet, and neither have the available powertrains. As a reminder, the regular Kona is available with either a naturally aspirated 2.0-liter four-cylinder making 147 horsepower, or a turbocharged 1.6-liter four-cylinder making 175 horsepower. Both versions are available with front- or all-wheel drive. Previous articleStella Vie – Solar powered autonomous car? Spaceship vibes.